The use of online forms is much more commonplace these days. Running a paperless office can reduce costs, is environmentally friendly and can save time in back and forth mailing. In one of our recent blog posts, we talked about the top reasons to switch to paperless forms. So, it's no wonder that many businesses are opting to use forms online. However, one common concern that people have is about the bit at the bottom of the form. The signature that authenticates it. Luckily, there's an easy way to solve this problem. New technology has made it possible to collect digital signatures. With electronic signature software, there's simply no need to get people to sign pieces of paper anymore. Here at Formidable, we're always looking for new ways to make online forms easier for our users. While we already support digital signatures, we wanted to expand on this. 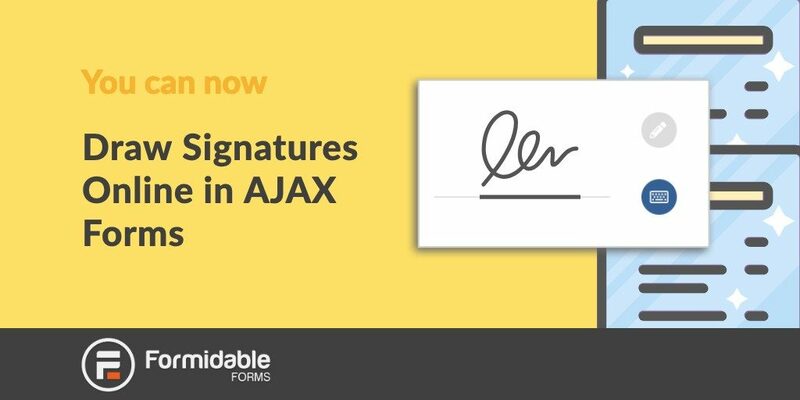 This new update makes it possible for users to draw signatures online in Ajax forms specifically. What is now supported in Ajax signature forms? How else have we improved drawing signatures online? Our signature field has a brand new look since the last update. This now shows the signature field in the form builder to make everything a bit clearer and easier to use. The signature value will also create an image when it is saved, immediately. This saves the URL of the image for easier display within the form. Signatures can now be edited in single page forms, until a draft is submitted too. You can also see our changelog for more details about what the new feature includes. If you would like more information, our blog post on how to collect electronic signatures in your online forms will show you how to use our signature add-on. If you're not already using Formidable Forms, take a look at our simple drag and drop form builder.